Nine-year-old Edmund Lee is a great student. 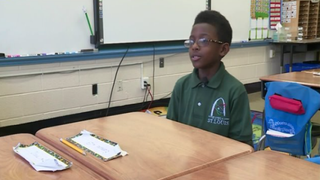 He’s a third-grader at Gateway Science Academy, a charter school in south St. Louis. He’s been a student there since kindergarten, and he wants to stay there, but an archaic law on the city’s books won’t allow him to attend the school anymore because he’s black. Everything was fine as long as Edmund and his family lived in the city of St. Louis. But their recent move to the suburbs means that Edmund can’t attend his old school. Because of the way that St. Louis’ laws are written, suburban kids cannot attend city schools if they are black. The law was passed decades ago and was meant to address school segregation. School officials told the news station that because it’s the law, their hands are tied, but they welcome revisiting the rules. White has launched a petition, asking lawmakers to take notice of her situation, adding that this isn’t just about her son, since she has heard from white students’ parents who were also unable to transfer to the school of their choice. Tiffany Luis, Edmund’s third-grade teacher, told Fox 2 that it would be sad not to see Edmund at the school next year.